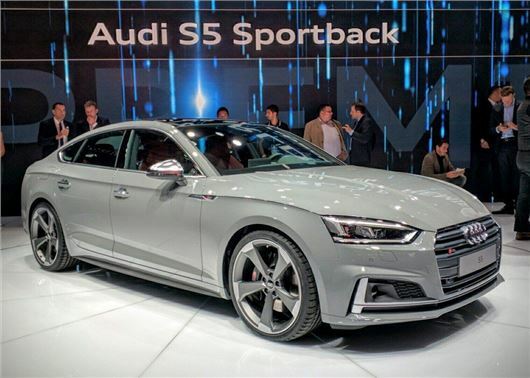 Audi has revealed the new A5 Sportback. The five-door A5 made its debut at the Paris Motor Show and will cost in the region of £31,500 when it arrives in showrooms from early 2017. Order books open in October. The Audi A5 Sportback looks identical to the A5 coupe, but gets a five-door layout in place of the latter’s three. There are changes inside, with more space than before, meaning better leg room for those in the back although boot space is unchanged at 480 litres. Like the new A5 Coupe, the Sportback will have a better quality and more up to date interior. After almost a decade on sale, it’s no surprise that the interior of the outgoing A5 was starting to shows its age. The engine range follows the A5 Coupe and includes the 2.0 TDI with 190PS that will prove very popular thanks to improved economy with a claimed 67.3mpg according to the Audi figures. There's also an ultra version of the 2.0 TDI which has the same power but economy is improved to an official 68.9mpg thanks to extras such as low rolling resistance tyres. Petrol buyers get the option of the 2.0 TFSI, available in two versions, with either 190PS or 252PS. Audi will also offer a performance-focused 3.0 TDI, with 218PS or 286PS. Front-wheel drive is standard, with quattro all-wheel drive available as an option on all models and standard on the 3.0 TDI with 286PS. The A5 Sportback gets a new quattro system that operates as an on-demand four-wheel drive system rather than permanent one. That means it runs in front-wheel drive the majority of the time, saving fuel. The performance model - until the new RS5 arrives at any rate - is the S5. This has a 3.0 TFSI V6 engine producing 354PS giving it a 0-62mph time of 4.7 seconds. Standard equipment will include LED rear lights, Audi MMI radio plus with a seven-inch colour display, Bluetooth, a three-spoke leather multifunction steering wheel and the Audi drive select dynamic handling system. The Audi virtual cockpit will also be available. As an optional extra of course.